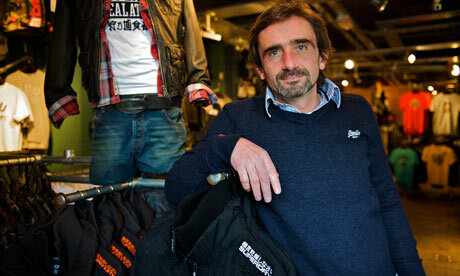 Interview: Julian Dunkerton, Superdry | How Did They Do It? The extraordinary growth of Superdry can in large part be credited to Julian Dunkerton’s strict adherence to a number of core business principles that have started to reshape the way clothing and other parts of the retail sector work. Superdry’s distinctive twist on British and American classic designs was inspired by a research trip to Japan, where Julian and his business partner became interested in the bright colours and bold text from Japanese packaging. Since it started trading, the company has received a number of key celebrity endorsements from David Beckham, Jamie Oliver and Leonardo DiCaprio amongst others. In March 2010 it floated on the stock market with a valuation of £400 million, by December it had a market capitalisation of £1.2 billion. The co-founder of one of the most successful British business ventures in recent times is now thought to be worth an estimated £300 million. But Julian is no stranger to hard work. He started his business career at the age of 19, living off a £40/week government business grant and moving clothes from London to his shop in Herefordshire on the train. He sold his first shop to his business partner within a year and then moved to Cheltenham, where SuperGroup PLC still has its headquarters. Julian remains thoroughly committed to the business, citing the drive to expand abroad as a major source of motivation for him. Above all else, Julian advises aspiring entrepreneurs to work hard and put the interests of the business above personal interests, keeping focused on staff, the needs of the consumer and the bottom line rather than the rewards that come with running a successful business. How did you get into retail, having left school when you did? I moved from London when I was 14, to Herefordshire, and I don’t know if you know rural Herefordshire but there’s not a lot going on. I took the wrong subjects at A-Level, Physics, Chemistry and Biology and I absolutely hated them. I stuck it out and got 3 Es so passed but very unattractively and just knew that it wasn’t for me, and obviously that made university impossible, though I could have gone to a poly, but to do what? I took a year out, worked in factories and farms and so on to get the money to go traveling. Coming from London and spending my childhood buying clothes in Kensington Market and Camden Market I knew there was stuff that simply wasn’t available in rural Herefordshire. At the time there was a scheme called the Enterprise Allowance Scheme, which was a government funded deal where you had to go unemployed for 13 weeks, which I did to get the £40/week that supported me while I started the business. I borrowed £2000 and I persuaded a guy to join me in opening a shop in Herefordshire. I literally went down to London, bought clothes from various wholesalers, brought them back and it took off. That year, I paid back my loan to my family. I hate debt, I feel a massive moral obligation to pay it back, so I paid back the loan very quickly. Then the guy that I set it up with decided to join me running it and that didn’t really work out, he quickly proved that he had no business skills whatsoever, so I decided to sell it to him. That was a year long process and I made £16,000, bearing in mind this was the mid-80s. I decided Cheltenham was the place where I wanted to settle, there wasn’t too much competition and I repeated the same deal with my friend who had gone travelling with me, by which time it was called Cult Clothing Co. and I have been here ever since. And it was through Cult that you began to develop the strategy that has served Superdry so well, the lack of in-store sales, the lack of advertising, and your own anonymity, it seems like a set formula, is it something you had to sit down and work out or was that your natural approach? It’s all very logical. Keeping a low profile so that nobody copied us, or copied me, as it was in the early days. Secondly, in terms of not having sales, having watched other business models, and building up other people’s brands through the Cult brand I worked out that actually the traditional retail model was flawed. If you take the winter period it lasts from September till about March and if it gets very hot in March it’s a rarity, so to put all your winter product on sale half way through the season is totally irrational and therefore it is built around somebody else’s conception of what makes logical business. People fall into this trap of not actually thinking for themselves, they emulate without thinking. You want people to buy Christmas products in your store and yet you devalue products the day after Christmas? That makes no sense to me. So I have tried to make stuff affordable all the way through the year so that you pick something up and go “it’s worth it” rather than overpricing it for eight months and being on sale for months, that seems totally irrational. You have talked about Superdry as a “global lifestyle brand”, rather than a straight-forward clothing company. How far do you think you can take that idea? Could Superdry become an umbrella brand for a variety of different products? There’s two ways you can bring about a “lifestyle brand”, if you like, you have a core product that started the whole thing and then you license it out to lots of people and that’s a trap that everyone falls into. So if you go into Company A, you’ll pick up some shoddy item, you will find a shoddy version of a mediocre brand, such as a pair of glasses. Actually you’ve got to follow your philosophy through every product that you touch. We made a few mistakes at the beginning but now we’re really getting total control of every product that we touch, and making sure that when you pick it up it’s better quality than everyone else for the price that we’re asking. So you should end up being a very happy consumer with every product that we get involved in. That’s what it’s all about. Would you say that you have achieved a good work-life balance? Surprisingly, over the past 30-odd years I think I’ve had an amazing work-life balance. I’m proud, I think, of being a good dad. I could probably do with some more fishing time but that’s because I choose to spend all my spare time with my kids and my family. So I’ll be home at 6 o’clock tonight and I will spend every weekend with my children. I know you don’t like talking about your own personal wealth but I think it would be interesting for people to know what motivates you to come into work. Because you have that choice, I think it would be fair to say, you could be doing other things. The thing is with people like me, we love work. For this brand to conquer another country, to keep developing, to employ more people. I get excited by seeing products being created by the design team because I know it means progress. Progress is what I thrive on, so if you look at my history, I could have retired years ago but I would have gone mad! I like being challenged and there’s nothing like the fashion industry for an intellectual challenge. It’s never static. It’s an adrenaline rush that you would find hard to achieve anywhere else. I’m not an object man, I don’t need to own yachts. The thought of bobbing around on the Mediterranean for a week would drive me insane. You have been noted for being quite conservative – with a small ‘c’ – with your spending. Correct. I have had a philosophy for 28 years where I never spent anymore than 10% of what I earned, and like I say, objects don’t concern me. My old philosophy was that so long as I could afford a round of drinks and a meal out then, what else do I need? You’ve talked about the importance of maintaining an interest in the news. Do you still find the time to read the newspapers? As best I can. I do on any journey I am doing. On a normal working day I do not have time, I don’t travel as much as I used to, I am more office bound than I used to be. I try to get a different political perspective as well. My natural paper is probably The Guardian in terms of politics but I read The Telegraph as well for different aspects of politics and for their business pages. I never indulged in supporting football teams because it would have taken too much of my time. I watch people and they go straight to the back pages and I’m thinking: “You’ve got to read the first 20 pages before you’re allowed to read that!”. It’s your treat! So have you been strict about which hobbies you have pursued? What’s the next big thing that’s going to hit the clothing industry in your opinion? The most important thing is that it’s doing what the car industry did over the last five decades. They were talking about historical car brands on Radio 4 this morning and what you’ve got now is total consolidation, so the independent multi-brand store, which is how I started, is going to disappear, virtually. It’s going to become a difficult business. If you’re a particular social group and buying into the car industry you might buy a Mercedes, or a BMW, or an Audi, or one of those brands that compete in that market. In another market you might be after a Bentley or a Rolls-Royce. Actually every segment is divided into a few brands, on a global scale but there’s enough choice out there to keep everybody happy and that’s what you are now seeing in the clothing industry. You are getting the consolidation of brands, if you like, owning particular parts of consumer behaviour. Is there anything else you have on your radar? Any plans for a massive diversion into another area? I own a few pub-restaurants. But no in terms of my main business – this is my main business. Probably this sector will always be my main business, I imagine. I started a coffee chain [Soho Coffee Co.] with James, my design partner at Superdry in a bored state. There are now more than 25 branches. My biggest love now is trying to work out what’s best for the country. I used to stand for the local Labour council back in 1985. I feel very British, so I don’t hide my money away in tax havens. Well for one thing it was the enterprise allowance scheme that got your going so it would hardly be ethical! It doesn’t stop most people in my position! I’m probably a complete oddity to be honest but I feel very British, I feel very proud to be British and I want to pay all my taxes here but I also like calculating what the government should be doing to help the country. People often criticise me for being a business woman and chasing the £££. This often comes as a result of working long hours, every day, sometimes sacrificing luxuries. But I have to explain that to me it’s not about the money. It’s about playing the game, making the right decision, seeing my customers happy and watching the business grow and gain momentum. This is where I get my enjoyment and the money just happens to be a result of that enjoyment. I read this interview and it’s a huge relief to hear that this is ‘normal’ because it’s easy to assume that business men and women simply chase the money at whatever cost. I used to buy Goth clothes from Mr. Dunkerton at his, pretty small, market stall up in Regents Arcade, pre Cult Clothing. Amazing to see where it’s led. He still says hi now 25 years on. I know it sounds cliche but it couldn’t have happened to a nicer bloke, or rather, made to happen by a nicer bloke.